We like the cut of Porsche’s jib. The 70-year-old German firm continually fine tunes its electrification technology year after year. The newest salvo in its offensive is the Cayenne E-Hybrid, which returned as a plug-in hybrid model with the promise of delivering more versatility, tech, and efficiency than its predecessor. We traveled to the south of France for our 2019 Porsche Cayenne E-Hybrid first drive review to find out how the sports car maker united performance and eco-friendliness. The Cayenne E-Hybrid starts at $79,900 before Porsche adds a mandatory $1,050 destination charge. It’s positioned between the base version of the SUV, which costs $65,700, and the Cayenne S, which carries a base price of $82,900. To add context, Porsche charges over $124,000 for the high-zoot Cayenne Turbo. For the money, the E-Hybrid offers a long list of standard features whose highlights include 19-inch wheels, an electric parking brake, a power-operated rear hatch, internet-connected navigation, Bluetooth connectivity, a 10-speaker sound system, parking sensors on both ends, and dual-zone climate control. 22-inch alloy wheels and a head-up display join the list of options for the first time on any Porsche, regardless of body style. Rivals like the Maserati Levante and Land Rover’s Range Rover Sport compete with the Cayenne for the attention of buyers. The E-Hybrid variant’s most direct competitor is the Range Rover Sport P400e, which also packs a gasoline-electric drivetrain and starts at $78,300. It’s slower and less powerful than its German adversary. It’s also older, though it recently benefited from updates inside and out. The Levante isn’t offered as a hybrid – at least not yet. We hear the firm’s product planning department placed a plug-in model high on its list of priorities. Prospective buyers can also look at the Mercedes-Benz GLE550e and the BMW X5 xDrive40e. Both are a little bit smaller than the Cayenne and priced much lower, but they answer to the same calling of blending performance with Prius-like tailpipe emissions. And, with a list of options longer than Don Quixote, it’s easy to spec either well into Cayenne territory – and beyond. 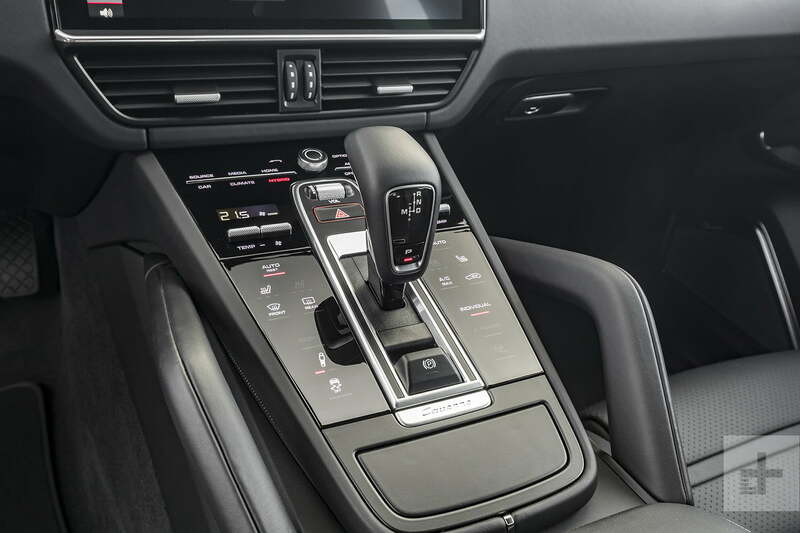 Interior designers neatly embedded a beautiful, 12.3-inch touch screen into the Cayenne’s dashboard to display the Porsche Communication Management (PCM) infotainment system – the same one we loved in the world-dominating 911 GT3. It’s bigger than the competition’s and it offers one of the best resolutions we’ve seen in any segment of the market regardless of price. It’s even better than the unit found in recent Mercedes-Benz models, which we’ve praised in the past, and our time behind the wheel revealed it’s also easier to use on a daily basis. Menu tiles stacked vertically on the left side of the screen let the front passengers access features like navigation, phone, media, and car settings (including a few hybrid-specific ones). Most of these functions offer at least one sub-menu, and sometimes the sub-menus have sub-menus of their own. It sounds like a technology overdose worthy of Trainspotting’s darkest moments when you read about it but, in reality, it’s straight-forward considering the gargantuan amount of information it contains. The high-resolution color graphics are clearly labeled and neatly arranged. This system is as intuitive to use as a modern-day smartphone. Apple CarPlay compatibility comes standard, but there’s no Android Auto. While Porsche hasn’t announced plans to integrate it, Digital Trends learned that could change in the future. The Cayenne’s infotainment system is as intuitive to use as a modern-day smartphone. An analog tachometer sits front and center in the instrument cluster. It’s flanked by a pair of driver-configurable seven-inch screens. They show a wide scope of information including the tire pressure, vehicle vitals like the oil temperature and the battery voltage, navigation directions, and the energy flow. Every E-Hybrid comes with the track-bred Sport Chrono package, which contributes a lap timer and a g-force meter to the list of data available for display in the instrument cluster. The Cayenne stays ahead of the curve – literally – when equipped with InnoDrive, Porsche’s home-brewed evolution of cruise control. This company-exclusive technology relies on sensor data, information sent by the traction control system, and navigation points to paint a virtual picture of the itinerary programmed in the GPS. It stays nearly two miles ahead of the driver at all times so it knows when there is a hill it needs to accelerate for, a sharp bend that requires slowing down, or a roundabout it can’t drive through at 55 mph. It can also decide ahead of time when to use electric power, when to use V6 power, and when to blend both. The powertrain seamlessly makes the transition between watts and gasoline. InnoDrive is a sensor-based technology; none of the information it uses to steer, brake, or accelerate comes via an internet connection. Don’t get the wrong idea, though; the era of the autonomous sports SUV isn’t upon us yet. It’s a level two system, meaning the driver still needs to keep both hands on the steering wheel and both eyes on the road at all times. As crazy cheap depth-sending lidar sensors begin to emerge, some experts think we could start to see true self-driving cars by 2020, but we’re not there yet. The Cayenne earned its reputation for motoring excellence by fusing performance and luxury. The E-Hybrid is no exception, and the segment it competes in has become so ruthless in recent years that Porsche couldn’t afford to screw up. The different materials come together to create a cabin that feels like it’s sculpted from a solid block of opulence. It consequently made every stitch, switch, and surface nice to look at and to touch. The steering wheel boasts real metal spokes, for example, which sets the tone for the rest of the interior. If a material looks like leather, it is; if a part looks like wood, it is, too. The design is elegant, and the build quality is such that the different materials come together to create a cabin that feels like it’s sculpted from one solid block of opulence. We consider the Cayenne nicer inside than the Levante by a sizable margin. We place it ahead of the Range Rover Sport, too, though the British have recently demonstrated a first-rate ability to play catch-up. Porsche carved out space for five passengers. The front ones travel in comfort on power-adjustable, leather-upholstered chairs with integrated headrests and side bolsters. Front visibility is good, though wide D-pillars limit rear visibility. Available camera-aided parking tech, which provides a 360-degree view of the car’s surroundings, makes up for it. Smartphone-based remote-controlled parking will be offered a little bit later in the production run, Porsche told us. While three adults fit on the rear bench, the center console eats up some of the middle passenger’s leg room. We recommend saving that spot for short journeys or for shorter passengers. As a trade-off, the center console houses two air vents and a 12-volt socket to keep devices topped up. Storage bins big and small pepper the cabin, including one under the central arm rest. Cargo capacity checks in at 22 cubic feet with five passengers on board and about 56 with the rear bench folded flat. Both figures are average for the segment. Note the E-Hybrid’s lithium-ion battery pack reduces trunk space compared to the standard, non-hybrid Cayenne. From the one in 918 Spyder to the one in the Prius, modern hybrid powertrains come in all shapes and sizes. Like the one that powers the Panamera E-Hybrid, the Cayenne’s is built around a 3.0-liter V6 engine that uses a single turbocharger to deliver 340 horsepower and 331 pound-feet of torque on its own. Porsche tossed an electric motor into the equation to build a gasoline-electric system good for 462 hp between 5,250 and 6,500 rpm and 516 lb-ft. of torque from 1,000 to 3,750 rpm. The output reaches the SUV’s four wheels through an eight-speed automatic transmission. Porsche envisioned the electric driving mode as a way to save fuel and reduce local emissions, not for all-out high-performance driving. The motor sources electricity from a 14.1-kWh lithium-ion battery pack stuffed under the trunk floor. Charging it takes as little as 2.3 hours with the optional on-board quick charger, or about four hours with the standard charger. The Cayenne always starts in electric-only mode if it has a full charge, which ours did, so we didn’t use a drop of fuel during the first 20 or so minutes of our time behind the wheel. Driving on battery power delivers precisely the type of smooth, quiet ride you expect from an electric car, though it comes at the expense of performance. That was predictable; Porsche envisioned the electric driving mode as a way to save fuel and reduce local emissions, not for all-out high-performance driving. The Cayenne can nonetheless reach 83 mph without burning gas, but it gets there at a leisurely pace. The E-Hybrid’s athletic genes become increasingly dominant when the V6 wakes up. Porsche calls the other three driving modes Hybrid Auto, Sport, and Sport+, respectively. Turning the mode selector dial clockwise gradually makes the Cayenne sportier. It didn’t take long for us to find the perfect formula, and unlike Coca-Cola, we’ll share it with you. We best enjoyed the Cayenne E-Hybrid when leaving it in Sport+ on twisty roads, switching to Hybrid Auto in normal driving conditions (on two-lane highways, for example), and selecting the electric-only mode when driving through a town at low speeds. We took full advantage of the gasoline-electric powertrain that way. We activated e-charge mode, which sends electricity back to the battery pack, whenever the V6 was on. Fittingly for a Porsche, driving the Cayenne hard in Sport+ is the best way to generate electricity. While doing so, we enjoyed one of the most sublime chassis in the SUV world. The latest Cayenne does its best to overcome its not-insignificant 5,000-pound mass and handles better than a tall soft-roader has any right to. We attribute part of the agility to the rear-axle steering system our tester came equipped with, which makes the Cayenne feel smaller than it truly is, and another part of it to Porsche’s decades-long expertise in suspension tuning. The ride is always rather firm, even with the optional air suspension set to its softest setting, but if suppleness is a priority there’s a Kia K900 with your name written on it. Communicative steering and powerful brakes bolster the Cayenne’s claim to fame as the sports car of the SUV segment. It delivers the sharp, engaging driving experience that’s so important in the constitution of the Porsche character. The Cayenne delivers the sharp, engaging driving experience that’s so important in the constitution of the Porsche character. And then there’s the Sport Response button on the steering wheel, which illustrates another facet of the E-Hybrid’s drivetrain. Pressing it squeezes every last iota of power from the drivetrain for 20 seconds (a timer pops up on the instrument cluster) to provide an acceleration boost. It’s helpful when passing, when merging on the highway, or when you simply want to put the scenery on fast forward. The Cayenne returns to its normal state of being a well-mannered cruiser after the 20-second push-to-pass spurt. We didn’t spend enough time behind the wheel to measure real-world fuel economy. The EPA hasn’t released official figures, either, but we realistically expect the E-Hybrid will easily become the fuel efficiency champ of the Cayenne family. 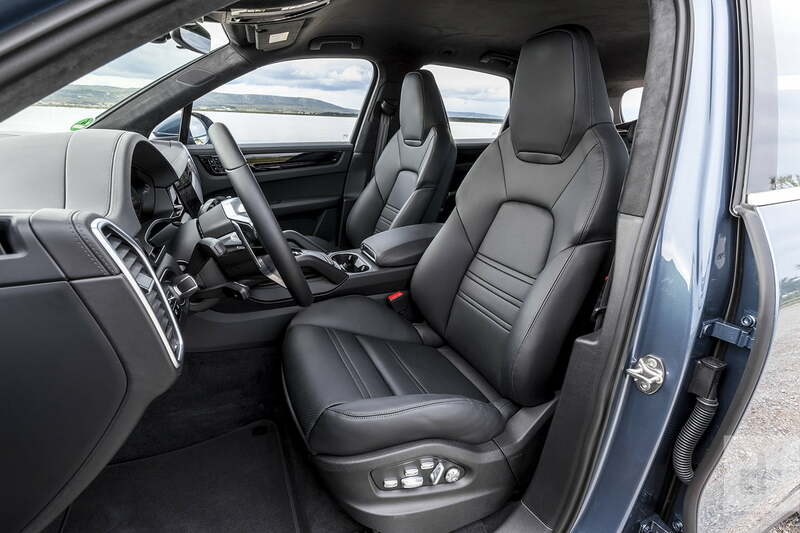 The Cayenne offers dual front, side, and knee airbags for the front passengers in addition to rear side airbags and curtain airbags that stretch from the A- to the C-pillar on both sides of the car. And that’s just the stuff that fills with nitrogen to keep you and yours safe. Properly equipped, the Cayenne can also brake or steer its way out of trouble thanks to driving aids like lane-change assist and adaptive cruise control. Note both features are found on the list of extra-cost options. Like every new Porsche, the Cayenne E-Hybrid comes with a warranty that lasts four years or 50,000 miles, whichever comes first. It’s also covered by a 12-year corrosion warranty. Porsche also pays for the first service, which the Cayenne requires when it’s a year old or when it’s covered 10,000 miles. If we were spending our own money, we’d select Biscay blue metallic and order the optional 21-inch RS Spyder Design wheels. We’d keep the standard black interior and add the optional premium package, which bundles desirable features like lane-change assist, auto-dimming mirrors, and a surround sound system made by Bose. We’d also add the head-up display and the rear-axle steering system. The 2019 E-Hybrid serves two purposes in the Cayenne family. First, it’s a mid-range model that runs faster than the base and S variants without reaching the same level of performance (and, of course, cost) as the Turbo-badged, 541-hp flagship. Second, it has the right hardware to become the most fuel-efficient version of the third-generation Cayenne, one that skillfully demonstrates an SUV that’s large, luxurious, and fast doesn’t always guzzle gas.